Home > Scientist Of The Past Who Shaped Our Present And Future > Now you see me! Imagine looking at a painting of a scenery and the same scenery through a window, both having same dimensions. If you halved the dimensions of both, the painting and the window. You wouldn’t be able to relish the complete scenery with the painting now, would you? The same would be the case with the window. However, if you changed your view point, you would be able to regain the original scenery by standing at a certain point. This is the basic difference between a photograph and a holograph. 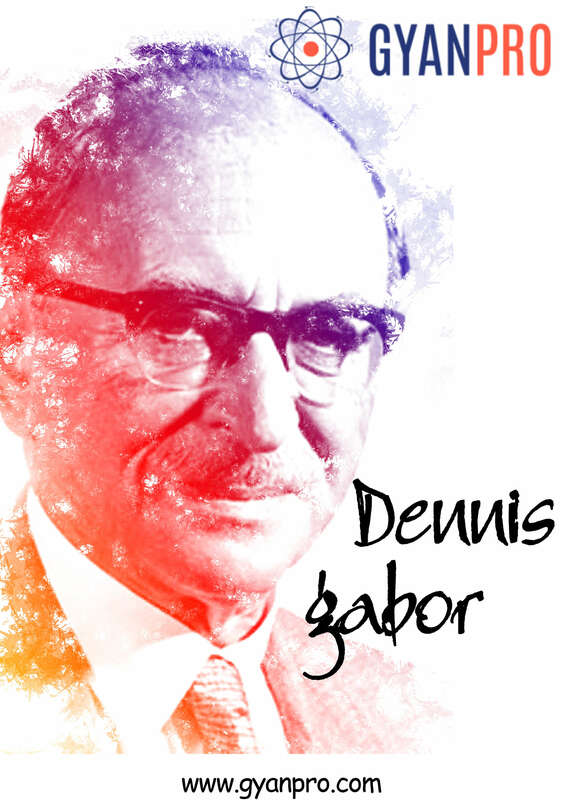 Dennis Gabor was born on June 5, 1900 in Budapest, Hungary then a part of the Austro-Hungarian dual monarchy. He served with the Hungarian artillery in the last months of World War I, when he was 18. After the war he began studies in electrical engineering in Budapest and obtained a diploma in electrical engineering in 1924. In 1927, he attained a degree of Doctor in Engineering with thesis related to the development of one of the first high speed cathode ray oscillographs, in Berlin. He was a man of many inventions. As a proof of his fruitful work as an inventor he filed 62 patents between 1928 and 1971. Holography took its first step in 1947 in an electrical engineering laboratory where Gabor was working on improving the electron microscope. The spherical aberration of the magnetic lenses was a limitation, hindering the achievement of a perfect result. To solve this problem, Gabor thought of taking a bad picture of an electron and then correcting it using optical measures. He came up with an answer to his problems one morning when he was waiting for a tennis game on Easter day 1947. A two step process based on the wave nature of right, first step was interference, to spread the incoming light all over the receptor plate, and the next step was reconstructing the interfered wave using diffraction (reconstruction). However, one major difficulty that surfaced was that there was no easy way to attain a concentrated beam of light to be projected at the object to create a hologram, until LASER was invented in 1960. Gabor had to use, mercury arc lamps concentrated with a green filter. Due to the inadequate and imperfect results obtained he abandoned his work in 1955. In 1964, thanks to Emmett Leith who made the first hologram of a three dimensional object, other researchers followed in this pursuit. This holographic explosion rehabilitated the figure of Gabor, who went from being virtually unknown in 1962, to win the Nobel Prize in Physics in 1971. Stepping into the light – the Story of DeWitt Bristol Brace. An Invention that Shocked the World – The Story of Joseph Erlanger. “Gillette: The best a man can get.” Newton’s Rediscovery of Gravity! !